Tripe soup recipes, including one dish recipe broth soup with vegetables and meat materials as a complement. Tripe soup is a typical food of the country. 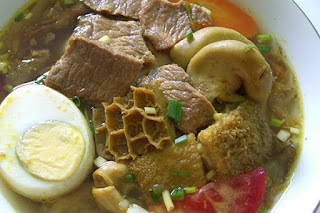 The meat is often used for the basic ingredients of this tripe soup is Beef, but did not rule out also made of mutton. In Indonesia alone there are actually many kinds of savory dishes that spread to every corner of the region, such as Madura Soto, Soto Padang, Holy Soto, Soto Bandung, Soto Banjar and others. How to make tripe soup itself is almost the same as the other soto. Tripe soup recipes are generally made of goat tripe or cow tripe served in soup bersantan yellow with fairly spicy flavor comes with vegetables, rice noodles and potatoes. Tripe soup is also commonly eaten with warm rice, so the combination of the two fusion food is very delicious and wagged his tongue. Tripe soup itself is usually found in some restaurants or eating houses in Indonesia. Thus, the food dish is very familiar in the ears. For those of you who have never tasted this food, now do not need to go to the restaurant quite make it at home with a dish of tripe soup recipe full here. First save the cow tripe on the pressure pot and pour water into it and input lime leaves and bay leaves. After that, close the banner and then turn on medium heat until the pan sizzled, and cook up to 30 minutes. Then cool the pan, then open the lid and waste water for decoction. Lift the cow tripe and cut into pieces according to taste, then set aside. Heat the oil in a pan, then enter all spices plus bay leaves, lime leaves, lemongrass and scallions and stir-fry until fragrant. Then add the pieces of beef tripe was into it and stir until fragrant. Pour water or beef broth, and cook again until boiling and all the flavors mingle. Then lift. Prepare bowls, save sprouts on top and pour over the tripe soup bowls containing sprouts earlier. Add the fried garlic, and celery leaves. Add lime juice and chili sauce if you like it spicy, and serve. Well, that's good beef tripe soup recipe, savory and delicious for your menu today. May be useful..